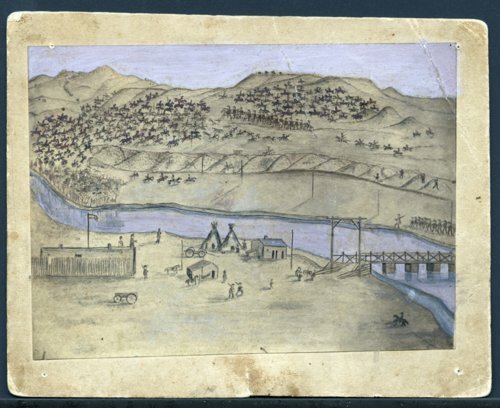 Here are two illustrations of the Platte Bridge Station drawn by Jesse Playford, a member of the 11th Kansas Cavalry, Company I. The station was established in 1858 as one of a series of fortified stations on the Oregon-California Trail. It was located on the south side of the North Platte River. Regular troops abandoned the station in 1859, the same year a 1,000-foot toll bridge was completed across the river. In 1862, during the Civil War, to counter increased Indian hostilities along the Oregon-California Trail and to guard the telegraph lines, volunteer regiments reoccupied Platte Bridge Station. The Indian threat reached a peak in the summer of 1865, when Lakota and Cheyenne descended on the trail from the Powder River country. At the time of the battle, the Platte Bridge Station was commanded by Major Martin Anderson of the 11th Kansas Cavalry. The garrison consisted of about 120 men of the Kansas Cavalry, detachments of Ohio Cavalry, and some volunteers. Following the battle, troops enlarged and rebuilt the fort in 1866, but the following year evacuated it and moved to Fort Fetterman, Wyoming. Almost immediately the Indians burned the buildings and the bridge.